The year out placement has played a vital role in broadening my vision. "The practical teaching method was the exciting way of learning construction concepts. The course also included economics module, which allowed me to understand the construction and housing market globally, which is really important to be aware of. Additionally, the new infrastructure of the university made a good impression on me. "The course provided me with a broad understanding of engineering, applied design, economics and building processes. Laboratory sessions conducted within the first and second year complemented the theoretical topics. All these topics were quite significant and influential during the placement year. 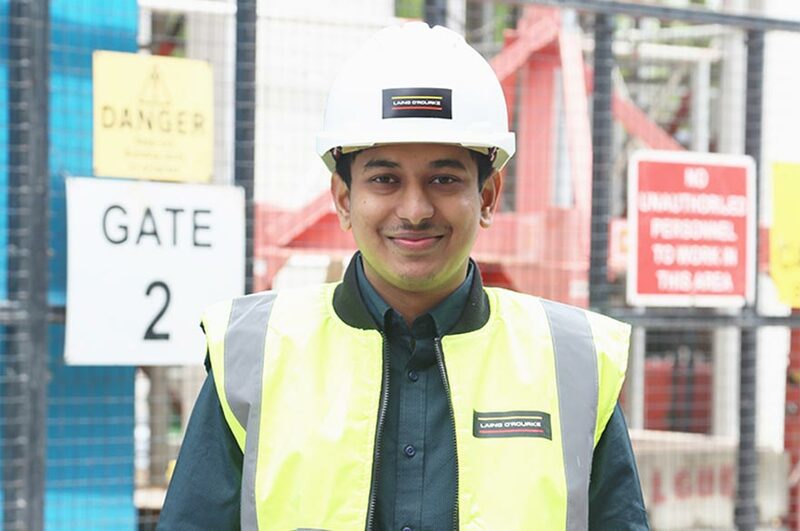 "I spent my placement year at Laing O’Rourke working on a high-end, luxurious apartments - Clarges Estate - a project worth £200m. Clarges Mayfair is a landmark development in the heart of Mayfair, close to Bond Street and overlooking Green Park and Buckingham Palace. The project includes 34 apartments ranging from £5m - £50m, a private wellness spa including a 25m swimming pool and fully equipped gymnasium, sauna, steam, treatment rooms, private cinema room and full lifestyle services. "I was placed in the management team in my first few months; I worked with the project quality lead. My main responsibilities were to look after the samples & benchmarks on A-site server and managing package tracker of the project. Later I was involved in the engineering team to gain understanding of pile foundation and top down construction method.